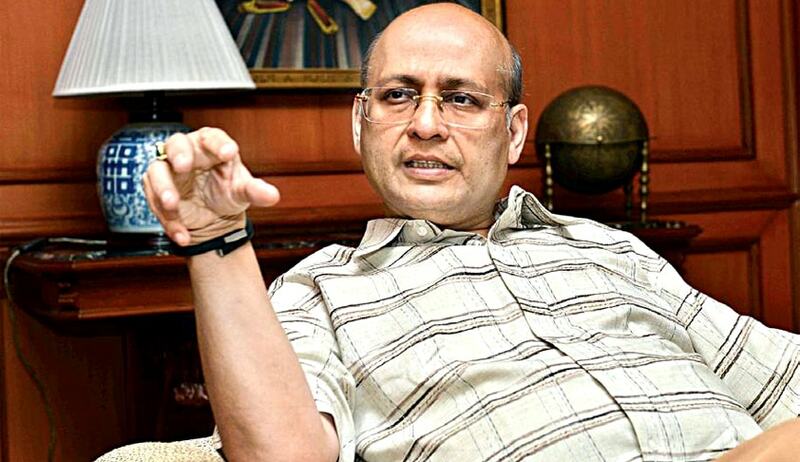 Dr. Abhishek Manu Singhvi (born 24 February 1959) is an eminent jurist, parliamentarian, visible media personality, well known columnist, author and commentator. He is the son of Dr. Laxmi Mall Singhvi, a renowned lawyer and India's former High Commissioner to the UK and Kamla Singhvi. He is a Member of Parliament; the senior most National Spokesperson of the Congress Party; the youngest designated Senior Advocate, Supreme Court (at age 34); a former and youngest Additional Solicitor General of India (ASG) (at 37) and former elected Vice President, Supreme Court Bar Association. He is former Chairman of the AICC All India Law and Human Rights Department and former Chairman, Parliamentary Committee on Law, Justice, Personnel & Grievances. He was formerly Vice Chairman of Congress’ Media Department. He obtained B.A.(Hons. ), M.A., Ph.D., PIL educated at St. Stephen's College, Trinity College, Cambridge and Harvard University . Dr. Singhvi completed his Ph.D. under constitutional lawyer Sir William Wade of Cambridge University. The topic of his doctoral dissertation at Cambridge University was on Emergency Powers. He was awarded and acknowledged by the Global Leader of Tomorrow Award in 1999. Live Law: Dr. Singhvi can you share with our readers, the experience of your early days in the profession as a lawyer? What inspired you to take up the legal profession? Dr. Singhvi: Let me start by saying that most of us including myself choose a profession more by a process of elimination than by a conscious choice. Although I was born in an ambience which smelt law, lived law, felt law, looked law, saw law. I was not even the least pressurized or pushed or nudged even by my father to go into this direction. As with many of us, we ultimately decide as we grow up that the other fascinating romanticisms we have, are not to be pursued and as you eliminate those choices one by one, you come in by a process of elimination. In fact the only one who pushed me or nudged me towards law ironically, was the only one not familiar with law in my family which was my mother and she did it for the strange reason that would make this unbeatable argument that where would all these books and library go if you don’t become a lawyer. You can’t junk them! As I grew up, I realized that it`s a good profession. I had seen and heard of people who are icons. I’m talking of people before my father’s time because of course, during my father’s time, I had seen a lot of them-from Palkhivala to Daphtary to Setalvad who were much older contemporaries of my father, my father was the younger one and I decided to give it a try and once you give it a try then, you persist. Law was not, I would consider even half as attractive a proposition when I joined as it is now. Law was a refuge of last resort, for many decades, including the time when I joined in the 70’s. You would try everything available to you including the administrative exams; other options, other vocations, and either semi-succeed or fail and then, turn to law. In a stark contrast it has now become an option of first choice. Secondly there would be a legal background in 99% of the cases of those nudged into law. Today, I know of a large number of cases where children, sons or daughters of industrialists, of architects, of military, of doctors, top people in their field, of successful businessmen are opting law as an option of first choice and the third vital difference I found, that is validating both of theseis that till recently like about 10 years ago or rather I would say in the last 10 years, there has been an explosion of lady lawyers. The lady lawyers are in all levels from the bottom to just below the top. I confess that they are not on the very top but otherwise they are doing exceedingly well. So these are the three very stark changes that I have seen. Live Law: How did you rise to the heights you presently occupy in the legal profession? Dr. Singhvi: Well, I think it’s very nice of you to use these flattering adjectives! I don’t think there is any such thing. First and foremost I am a very grounded person. I generally feel that there are thousands of people, even lakhs who are much much better than me. I often joke when I sit as chairman or members of interview boards and interview young people like you every time I would turn around and say that thank god I am not the interviewee because these chaps are much brighter than us and each generation in fact, you will find that people coming after you are brighter because they have choices which you never had. There are people specializing in entertainment law, sports law, some narrow areas of IPR, we didn’t have these options. Also you are exposed to the internet, you are tech-savy all these things are very different from our times. I think what got me to where I am without being untruthful, without being falsely humble is A. Sheer Hardwork B. Reasonable intelligence and C. An ability to present relatively complex issues in a simple way backed by reasonable articulations. In none of these, I would say I have been on top except, hardwork. I have been a topper right from kindergarten. I have topped every year expect few years when I have come second or third. And I have always joked that I have been going downhill after school because you cannot do better than what you have already done.So, I would say school was the great high-point in my life. Being good in academics made you very conscious of hardwork. And, the second quality I said is articulation and being able to express yourself. You will be astonished that I was a complete introvert in my school years and today, psychologically, I am a complete introvert. I am only a public persona. Only in the media and the courts, I am an extrovert. But, actually I am a reverse like a typical Piscean. In school, I was always shivering but, was asked to give all the top speeches and debates so, I had to work hard for that. I am not the one of those who will enter a room full of people and thrust out my hand all of a sudden and be like, “Hi!” Of course, I became an ambivert as they say, less introvert and more extrovert after I went to Cambridge that too for survival. And, then of course when you are thrown into the swimming pool at the deep ends in law practise which is entirely as a litigator, you have to hone your skills. Above all of this, I do recognise that there is good luck. As I said, there are thousands of people who are far better than me and have put in their hardwork but, it`s a combination of circumstances and God`s blessings and my parent`s blessings and good luck. Live Law: Sir, you have excelled in the varied roles of a lawyer, columnist, full-time politician and Parliamentarian. You are also frequently seen on prime time television eloquently defending your party or government as the case may be on various issues. How are you able to balance all these roles and responsibilities so adroitly? Dr. Singhvi: I have always felt that multitasking has been the joy of my life and it has also been the bane of my life. It`s been both. It’s not my way it’s purely taking life as it comes. It is not good, it is not bad it is a bit of both. I have now reached a stage where I am not very disheartened or sad when I am not able to do something. One of the problems of multitasking is that you feel very disheartened when you have not done, what you have not done and ignoring what you have done so that I think is important, to be content at where you have reached. If you are able to reach X case and then, you miss one case so be it. If you are able to do two things in the parliament and not the third so be it. It is a great great learning experience which is unrivalled. Let me give you an example. Why it is a great learning experience for me even at this age is that on a typical day and in fact it has happened to me many times, and now I have made it less consciously. I follow a system that every time you see me on T.V, I don’t do more than 3 shows a day, I’m not that interested and I don’t think people would like to watch me all the time. I’ve made less of court, less of running around, less of Parliament. I’ve done it all, I’ve been there. But the great learning I was talking about is that you get up in the morning and you prepare five, six, seven pieces and the learning curve lies in this that you imagine a problem in a typical case, X vs. Y, like your exam problem and You get up and you have one genre, one style, one species so that is getting up in the court, much equipped, precise, informative, grasp of the brief, technical, volume one, page five, my lords, this that. After two hours, it happens with me on an actual day, I’ve done five-six cases in a round, get into the car rush, change on route, enter parliament to reply to a debate. Unlike courts, in Parliament the respondents always open, it’s the other way around. Petitioners open in the courts; the opposition which is the respondent opens there. So the treasury bench is from where I spoke in all the major debates or replies. The reply is more difficult than the opening because in the opening you can say what you want but you have to reply to something that is already been said. So by finishing at 12:30 in court, you rush to Parliament and you speak. Now, you imagine a similar topic you argued in the morning and assume for a moment, that the same thing is being discussed in the Parliament, you will have a great learning curve because you then learn to put the same thing very differently, the canvas is broad, the tone is rhetorical. It must make a broad impression. Nobody is interested in Volume 1 Page 5. So, that ability to be able to change the presentation! The third example happens only to me and nobody else. On the same topic, we assume a press conference at four o’clock which I frequently take. Then you have the superficial bite, the short encapsulation in two lines. The essence of something without going into the details which is what the Press wants. Now, you can probably assume that the factual set of details is same for all the three activities. This has been done by me umpteen times. There is a fourth which has happened three-four times only (Thank God! Not more than that.) that after four o’clock you take a car and drive to a public rally in Meerut for example because it is closer to Delhi then the same topic as in the morning court you will say it in a totally different way, you will say it to rouse the crowd so the canvas becomes larger, larger and larger though the facts remain the same and there is a presentation of same facts very differently. The technicality, the legal ease, the oratory, the style, the language is different, the impact is different, the recipient is different but it is the same person and you assume a similar set of facts and find it. That is why I call this a great learning experience. However, it is not good for health, it is not something I would like to do too much and it just happened to be like that in my life. I have been an early achiever. In public life, I have to lead two distinct roles actually though I don`t really like the political life. Live Law: Which role do you enjoy the most? Dr. Singhvi: The precise reason I gave the example was that each is a great learning experience and each is to be cherished and it would be unfair for me to say that I enjoy X more than Y. Obviously, what I enjoy the most is the Law one,in quantum terms but, I have not enjoyed the others any less. From 2006 to now, till last year, I have opened every important debate of the Treasury Bench of the Parliament. I have opened the debate twice in the Office of Profit both in the first debate and after Ms. Sonia Gandhi resigned from the Lok Sabha. It`s not a small privilege and I thoroughly enjoyed it. I opened the Indo-US Nuclear Deal(I,II,III), the Libernham Ayodhya, the Internal Security debate, two or three Budget speeches, the Motion of Thanks for the President I opened twice etc. Lokpal, most importantly! I was the Chairman of that committee. So, each of these is very enjoyable. I am not telling you all the legal cases because you are law students so you know them. I always joke that it`s your ability or comprehension to miniaturize things. So, I won`t put one above the other though obviously, my vocation remains law! Live Law: Sir, you are the youngest person to receive the Senior Gown in the History of Supreme Court. What do you think about the recent controversy pertaining to the designation of Senior Advocates? Dr. Singhvi: First of all, I can candidly express the point, forget which lawyer crosses which year point, it’s the second point. The first point is that, and I am not saying that because I am a senior of 1993. I was a senior long before. But, you have to ask the basic question that why are we getting seniors who are not up to the mark and I am not saying that you are not up to the mark, that’s not the point! But, we all know that the seniors you see in the courts of India are either not genuine seniors or don’t deserve the appellations. The second point is that there is a debasement for it automatically-if you keep appointing professors that are worse, worse and worse, the term professor becomes debased. If I keep appointing CMD’s which are worse, worse and worse, the post becomes debased and comes down to the level of a General Manager. So that question has to be asked and that question is to be asked repeatedly by each High Court. The Supreme Court is just one court. There are 23-24 High Courts in the country and it’s no point in saying that the Senior of Delhi is five times better than the Senior of Nagaland. Why should you? So I think these are issues which are not addressed because I think we are not up to it. Thirdly, the controversy you mentioned is really a reflection of what I am saying. It’s because unfortunately, seniority is now granted on connections, on lobbying, most importantly, to people who continue to practice as advocates on record but, just want to have an appellation. There is no change in their practice style. Actually, you should feel proud of practicing as an Advocate. Why should you Akanksha, if you are a successful lawyer want to be a senior where you will continue to practice as prior to you being a senior? There is no hierarchical difference. I don’t look down on you if you are a Senior and I am a non-Senior. But what is happening unfortunately is that you continue to practice as an Advocate On Record. You draft, you meet clients but you want the title of a Senior. That mentality is something not addressed to and that is the part of the problem because either you get in on lobbying considerations or closeness considerations but, thirdly, if you keep seeking it even though you know that after getting it, you will continue with the same sort of practise. But yes I think today’s seniority has lost its value. If I was applying today, I wouldn’t have applied because I was happy practicing successfully. Why should I want be a senior? Because 80% of people don’t look upon them as seniors and the true test of a senior really is when you are briefed irrespective of clients who you are appearing for and the lawyers whom are appearing against in different courts. For example, this concept of designating a retired judge as a Senior automatically. This is a trivial exercise. You should get to choose. You may want to opt out as practising as a Senior. Live Law: Do you see an increasing tendency among the present generation of law school graduates and juniors to opt for the more lucrative corporate career route? Is the growing preference for a corporate career among our law students an inevitable fallout of the entry of the national Law schools and private institutions in the legal education scene? Dr. Singhvi: I think quantum wise, statistics wise, you are right, I haven’t checked up on that though I am sure you know. But I am not a person who looks down upon people, I am not critical of the fact that more are not coming into litigation. My point is that over time we are an excessively court-centric society and my generation is more like we are not good at anything else apart from what we do in court but two generations down the line a lot of us would be chamber lawyers. Why? Because courts are inherently slow vehicles of justice in our country and we have to do work outside the court. So point number one is, merely because you are not a litigator, I don’t look down upon you. Point number two is, I am not concerned with that if you are a litigator, the quality of litigation should be high rather when you are a litigator or chamber lawyer. Both are equally valid points. But if you choose litigation then, that should be of a high-level. Three, I think over time, the very litigation quantum should decrease and that will decrease only if smart lawyering happens outside the courts so there is no harm. Therefore, my point of view is more of quality and categorization rather than of quantum. The fourth point is, which is a huge category out there which is being built up fortunately and which we have ignored is of In-House Law heads. See now, the categorization must expand. The first level is the In-House and In-House goes up to the head. Second category is direct practitioners. Third category is solicitor firms. Fourth category is Counsel(non-designated). And the Fifth category is Senior Counsel. Now, each had a valid base but the most ignored has been the In-House. They were once considered as non-entities, they are now becoming important. They should not be allowed to become as important as they are in America where nothing will go unless the In-House Legal head clears, or else they will actually veto us. In our country, the other extreme was followed in which the company heads would ignore them, they will just make you a lawyer then, just walk all over you. The middle ground is correct, where they are given weight, they are given status, and they are given importance, important decisions of the company, of the Chairman are not taken without them and in case of absolute veto it should at least be subject to be overridden by an outside element Counsel. That development is happening and it’s a very exciting development. A top industrialist told me (I’m talking of the very top 2 or 3 of India) and it’s very interesting that a large number of British Solicitors and lawyers who are of top firms (The Magic Circle Firms), are happy to lead or head as the Indian head department of their company. And he said if I have a law department of say 50 people with a top head, it will be cheaper for me than to go out and engage lawyers because they are available, they will sit in your company, they are next door and the very same people who are working outside the company, you need to explain more. So, in that case, the company can pay more. The capacity is there. Now that will happen ultimately, in which case you’ll see that a lot of outside lawyers will become less. Live Law: Sir, the desirability of permitting foreign law firms to set up shop in India has been a talking point for some time now. Do you think it is desirable to permit foreign law firms to practice law in India? What impact do you think the entry of foreign law firms in the Indian legal scene will have on the legal profession and the practice of law in India? Dr. Singhvi: See I think this debate is more being taken up by rhetoric emotion, provocation, scoring and debating point, ego and not on merits and logic, that’s the tragedy of this. I do believe that foreign law firms have a role. I do believe that they should not and do not have a role in litigation. They should not have unless in special cases, they always give special license in some exceptional cases but that’s very rare. However, that is very different from saying that foreign law firms cannot enter India to handhold their foreign clients. Why should they not? Indian firms cannot handhold their clients going out. But more importantly, why cannot foreign law firms collaborate, semi-merge or merge with Indian law firms and do work which will be beneficial. According to me, I have no doubt and I am excluding litigation from this discussion altogether, almost every segment of law in India, (I am talking of Indian law firms, not foreign) would normally benefit. This threat of being swallowed up or eaten up by the big fish is largely common. As a matter of fact, the only people who need to be scared slightly are the very big law firms. They might be displaced. The very big law firms would either be displaced or their efficiency will increase because they have to compete with the top law firms and I think that’s where the mismatch is coming from. The guys who are actually most benefitted by this influx are opposing it the most and the guys who are actually hurt are watching the fun on the side. If we exclude litigation from the first phase, I think the time is ripe to try Phase One of foreign law firms under “controlled conditions” and of course, for non-litigation foreign law firms, reciprocity can be implemented. See if you are Guatemalan coming and practicing law in a non-litigation environment here, why should I be not able to practice corporate law in Guatemala? How is it a problem? And Guatemala will immediately agree, so will U.S.A, so will U.K and if you have to take an exam and do it, then they will take a Bar Council exam then they should employ five lawyers who will take the bar council exam. See a foreigner takes an exam, a lawyer takes an exam, so five Indians can take an exam for a foreign law firm. But, litigation is different, that’s a little different, that I agree. And let us try it under controlled conditions, let us not give it a full green signal. I have no doubt that the average ordinary law will improve. Just consider now, just now you saw some shakeouts of big law firms. I am not taking names. Do you know how much movement of lawyers happened? How much salary has increased? Just now in the last three or four months, every Indian lawyer benefitted from the competition because one law firm broke up to become two law firms so therefore, the salaries, the terms, the opportunities, the slots, the numbers all increased for all of you. Ultimately, it is you guys who benefitted. Live Law: Recently, we witnessed a near confrontation between the bench and the Bar in the SC when the SCBA led by a pro-active president (Dushyant Dave) convened a General Body Meeting to pass a resolution to boycott all official functions with SC judges if their demands of enhancing the facilities for the Bar in the SC were not met by the Court. (Fortunately, an unpleasant situation was avoided as the CJI constituted a Committee of 5 judges to look into the grievances of the SCBA.) How do you view this growing confrontation between the Bar and the Bench? Dr. Singhvi: As Aristotle once said, “Virtue lies in the middle, it is the mean of two extremes and always each extreme is wise.” So there is a little bit truth on both sides. There is no doubt that the provocative, confrontational tone and content of the Chief was wrong. We are not here to fight in this manner with what are usually, rhetorically being called two wheels of justice. This kind can escalate into a complete non-communication between the Bar and the Bench which can lead you to a stage which is not good for the system. But equally, equally ego, pride, haughty, high horse is something I don’t expect judges to show. Equally, the judges should have reached out much, much earlier. Why should the judges have waited for a day before to have constituted this committee? Why should the judges not have communicated? One of the major grievances was that you never met us and that grievance should have been completely rectified and rectifiable. So the moral of the story is that there should be a straightforward meeting and on that meeting, in a conveyable atmosphere all the issues should be identified and instead of arriving at a decision immediately, it should be discussed. And then, Judges have a right to say no, nobody is saying to force them but they don’t have a right to listen and in many cases. So I am equally critical of both sides, one for different reason, the other for different reason. Live Law: What are your views on the All India Judicial Services Exam and how soon do you think that it will be implemented? Dr. Singhvi: It’s a tragedy! I cannot imagine how the Supreme Court can give a judgement ten years ago and it is still not implemented. Forget All India Exam, there are judgments of Supreme Court which says there should be uniformity. There should be the same salary. Like if you are a district judge in Karnataka and you are a district judge in Maharashtra, it can’t be usually varied. There will be some variations. Your library and his library should be more uniform. Your P.A and her P.A should be made uniform. Your H.R.A and her H.R.A, transport, car, staff, there should be a broad uniformity in civil services even though, it is a state subject and infrastructure should be provided and ideally, of course, All India Judicial Services should be one example. These are what I call-the costs of Federalism! Each state zealously and jealously and I think very frequently, wrongly guards it`s turf. It is believed that the turf also tends to interfere to exercise power and control but it is not good for the nation. If you can have an All India Administrative Service which is touted as the steep way into the bureaucracy then on what basis you can deny an All India Judicial Service. In any case, it should now open, Supreme Court has directed it so, there is no business to debate. And I think I would very strongly support and of course, I can understand uniformity cannot be an identity but, uniformity approximating to 85-90% similarity is something we have to considerably improve in our system. And I am not talking of the exam alone, I am talking about all the perks, infrastructure and condition of services. You know a judge in Gurgaon may have something entirely different from a judge in Kerela. Why should that be? They have the same powers at least, in non-chartered High Courts. They have the same function and they are a very special branch of an organ of the state, they are not normally executive or legislature. Live Law: Sir, but basically it is argued that young law graduates will just sit on this post whereas people with a lot of experience acquire such posts? Dr. Singhvi: Well, I agree there are some merits in that. You should beat the experience in the exam. Exam is not going to allow you to become a Judge immediately. Have a Judicial Service Exam, have an experience component before you start sitting on the Bench and dispensing justice, you have experience. You can even have this exam which entitles you to the lowest rung for a short while. You are both batch mates, same age, same batch, same everything. You and I both give the exam.I succeed in the exam, I become a Munsif Judge. Now, you who have failed the exam, having no option, will practice law in the same court where I am a Munsif Judge. After three years, you are appointed a district judge direct whereas I’ll be only appointed as the civil judge. I am being overruled by you. You failed the exam but, you practiced for three years and got the experience. Now, both are wrong. I am a raw person, you don’t have the experience but she cannot be exercising appellate jurisdiction over you and become a high court judge when you both took the exam at the same time. Live Law: So what should be of a greater importance? Dr. Singhvi: Both! Have component of both. You can always have a system that you can take an exam and then you will not become a judge unless you practice for two years, like that. After being a lawyer what are you doing? Practicing, right? So you can do this. Your colleague or your junior becomes your senior as a judge immediately. Live Law: Dr. Singhvi, what is your considered opinion on the constitution of the National Judicial Appointments Commission? In what manner will the NJAC prove to be an improvement over the collegium system? Dr. Singhvi: Alexander Pope once said, “For forms of governance, let fools contest; whatever is best governed is best.” Ultimately models don’t matter, structures, institutions, rules and regulations do not create good institutions. I can create the best theoretical construct by five years of Ph.D research, give it to you and you can ruin it because you are incompetent so you must realize that. But, why I am in favour of NJAC, is not only because I voted for it, not only because I was the lead speaker of the statute of the upper house and not only because 99.9% of people supported it but, my logic is simple. One, you have tried and lived for 40 years with the executive system. In the first 40-45 years, largely in the first 30 years, it got debased and ruined over the next 15 years. It then, flirted with the first system then implemented the collegium system. The collegium similarly worked well for the first, seven-ten years and is now debased. Having given both a try, I think this one deserves a try because then one can be sure. I am not at all suggesting that this would succeed but, one thing I am sure is that the other two have failed. Thirdly, I think it is ideal to avoid the truth that the collegiums system has failed. They just don’t accept it. I deny that, it has failed. It has given them a sense of arrogance, a sense of cover, a sense of infallibility, and it is patently unconstitutional because they have, by misleading and distorting Article 124 etc., the powers they never had. The fourth point which everybody is forgetting is that NJAC is actually a continuation of the collegium system! This is what I am objecting to. You have become so used to having tasted blood that you don’t want to give up that power even minimally. Actually, you are giving up the power minimally. What is a collegium? It is a group of five judges in the Supreme Court, three in the High court. What is the NJAC? It is a group of six, of which three are judges. So it’s a heavily overlaiden system. The judges still have a majority, overwhelming sense of the collegium so there is no such difference. The only difference is that some balance is slightly righted, you are having some external element etc. Then, why are you objecting so much? So therefore, you still have a weighted average of a very great slant, in favour of the judiciary as against five out of five, you have three out of five but, you are still vehemently objecting to three out of six. And, in the normal course of decision making, let me tell you that all the three judges weigh one way. It is highly unlikely that the other two will easily object, unless there is something perverse. Unless there is something like if three of them say that this lady who is a criminal should be appointed but, then the other three will counter balance by saying that appoint some other lady who is not that good but, atleast is not a criminal. Now, why don’t they want that much interference? That’s my objection. But of course, what I say is strictly my opinion and obviously, it is subject to a subjudice matter going on in the constitutionality more. I don`t intend to interfere with a subjudice dispute. The Court can strike it down tomorrow. The Court may uphold this tomorrow. I am not at all commenting on the merits of that case. I am just giving you my view, whatever I have spoken about in the Parliament. Live Law: What was the most challenging case of your career? Dr. Singhvi: Ah! There are many. Most of these are challenging because the stakes are very high. There are very strong opponents from the other side. Money is paid to you only because the stakes are high. But, if you force me to single out something which is really not possible as there are many such cases! NTPC certainly was! There is a nice story behind it. BALCO was also very creative and challenging. Both happen to be arbitration cases. Live Law: Sir, what about the National Flag Case? Dr. Singhvi: National Flag Case is absolutely an example. See you remind me and there are so many things that come to my mind. NTPC was challenging because I started with my father. My father left before the single Judge. I was a raw junior and such an important case. Lt. Justice V. S. Deshpande was the Judge of the Delhi High Court. And he liked me just because I had a PhD and he was an academic kind of a guy so, he really could trust me with the case. I argued it alone before the Division Bench and also, partly before the Single Bench. I am talking about me as a raw junior.I lost both! International Arbitration, high stakes. I was for NTPC, public sector. To their credit, they had faith in me. They said, “No, no. You take your father`s advice/opinion and go ahead with it.” “But, I would personally prefer to get a senior. I don`t want to be massacred for losing!” They took Shanti Bhushan. It was argued before a Judge named Dr. Justice T. K. Thommen. Mr. Shanti Bhushan did serve some of my articles and argued extensively. Shanti Bhushan is my senior at the Bar. He argued it in response to the file. In Rejoinder, the Judge asked Mr.Bhushan to let me argue instead and so, I argued the rejoinder. And then, they reversed two judgements completely! It is that judgement which led to the amendment of the 1996 Act. Not only that Judgement, but a major part of the amendment was due to that judgement. In BALCO, I call it challenging because I was arguing for the Bhatia principle and few realised that I was arguing for an intermediate solution. One view was that Bhatia is right and the other view was that Bhatia is wrong. But, the last sentence of the Judgement actually accepts my solution which is that it will be prospectively overruled i.e BALCO will apply prospectively which is precisely what my argument was! I said that Bhatia, in the core is not wrong but, if you go to overrule Bhatia, don`t affect the pending cases. And they accepted that! So, formally I was lost it but, actually I won this case. Flag was, of course a great thing because it was a totally virgin and uncharted territory! I remember I joked with Justice Khare that this case is travelling from Court 6 to Court 1 because it`s been going back and forth since it started. The Government had also been taking `n` number of adjournments. I did research, we got American material and as a compliment, my entire written submissions were reproduced by the SCC in a separate section. The SCC reproduced the judgement prior to the general section, they start the judgement with my entire submission. And now, when I see that entire submission, it gives me an immense satisfaction. So these are all things that stand up in the way as challenges and God gives us the power to have Roses in December. So, we forget the thorns and we have these Roses! Live Law: Sir, when you look back at your career, what gives you the greatest amount of satisfaction? Dr. Singhvi: That’s a very difficult question. I am deeply dissatisfied with so many things. So yeah dissatisfaction but also, constructive dissatisfaction. I’m not a nit-picking, dissatisfied person. I have no regrets. Dissatisfaction I have in the sense that I retrospect wisely. I could have done things differently. As far as what has given me the latest pleasure, I think the fact that I have lived a full sixty minutes of every hour, all sixty seconds of every minute, has given me great pleasure. I’ve (a) filled up those sixty seconds doing a lot of work quantum-wise, (b) I have made a lot of diverse components of that sixty seconds. But to answer your question more specifically and less philosophically, it’s very difficult to say. I think the most satisfaction is the thrill which you yourself get of a job well done. When you argue even an easy case but much more so, when you argue a difficult case well and actually, we’re surprised that the result doesn’t matter. When you come out of the court and you feel that you’ve done it well, that satisfaction is purely internal and quite immeasurable. And I have felt that in so many cases like in BALCO, NTPC etc. And that`s something you don`t about to anyone outside and it`s your own. So, to rephrase it, it is the satisfaction/thrill/excitement which comes when you are on your legs and developing a point and then, when you complete and feel that all aspects of the case you`ve developed on your feet. It is more like the thrill of listening to music which is not quantifiable. Second thrill is exactly the same, when you have made a contribution to a Parliamentary debate. And I go further and say that this gets even better when you have researched it, worked it out and then, that goes well. Third, thrill/excitement is writing good pieces. I have been an author. And these things are something that at times, you are forced to do. I was a PhD student for three years at Cambridge and I wrote a two lakh words thesis and this one was on Emergency. It`s just a maze, it`s an ocean and when you finish this and look back, you find that finished product and you feel that satisfaction. I was probably then 22 or 24. Exactly the same thrill I felt, when about four years ago, there was a Solicitor who forced me to deliver a lecture at George Washington University and I did some research again because I had to meet some deadlines on Evolution of Fundamental Rights in India. This also got published in George Washington Law Review. Nariman and I were the two speakers there. Now, you see that`s nothing like nobody gives you money, nobody notices you, it is not a television programme. But I will actually tell you the thrill of presenting a research in front of an American audience about the vastness and richness of India. Sometimes, you get the same thrill in making a great point on a TV Debate. Lokpal gave me a big thrill. I will tell you the thrill there. I was the Chairman of a committee which is a mini-Parliament (Standing committees are mini-Parliaments). So, in my committee, we had some 31 members and 12 or 14 odd parties. We had younger people, older people, eminent people, every kind. You know Lalu Prasad, Paswan, Ram Jethmalani etc. and I was chairing it. The diversely fighting groups. We had evidence from Anna Hazare. I completed that work in less than six months involving some 152 hours. What gave me the supreme satisfaction was when I finished it all. I got the Parliament annexe open on three or four Saturdays and Sundays and dictated in a manner in which no Parliamentary Reports are actually dictated like a booklet with Title, Summary, Content, Index etc. And I got so many compliments for that after the Parliament came into session post-Christmas. So, these are the things that thrill you. Live Law: Sir, what advice would you give to the youngsters in the legal profession? How can they emulate the kind of success you achieved in your life? Dr. Singhvi: I told you that already: Hard work! Hard work! Hard work! There are substitutes to hard word but, not hard work and the rest is confidence in yourself, have patience, keep a sense of straight-forwardness and fairness. It is wrong to think that people only go by name or by relations. They do, no doubt, but people, the judges will appreciate you and immediately when you develop a reputation in the Bar (I am obviously talking about the Litigation side) of being a straight-forward chap who doesn’t mislead, you see a judge is fully entitled to dismiss you, in order to check and counter your arguments, but the fact that he broadly knows that you’ll not cheat him already is a big thing in his understanding of your persona, and people don’t realize how important that is. Over time, if you have in lesser or few months, a reputation of being articulate, persistent, not giving way and yet not being evasive or obstructive that makes a huge difference. They listen to you. And of course, you know there are two sides: the crux of success also is.You always say, I know I am going to lose because one side is going to win. You’ll be surprised that is not so. The whole of litigation is based on the principles we don’t know, namely, there is no black and white except, in one or two percent cases. It`s large shades of grey. If the life was black and white, there would be no judges, there would be no lawyers. What do think is a “black and white”, if you go deep enough and if you are able to put the best light on your client’s case, it’s the “grey” which you project. Now, I project grey my way, you project grey your way and that’s where the judge’s dilemma lies. And if he finds the ratio of grey reasonable and fair, you win. Precisely, there is no black and white only, counter to popular thought. Akanksha Prakash is a Student Reporter at Live Law and a third year student of Government Law College, Mumbai. Ajith is a Lawyer at High Court of Kerala.